Henceforth, May 21 will be a memorable date in the history of Russian go. 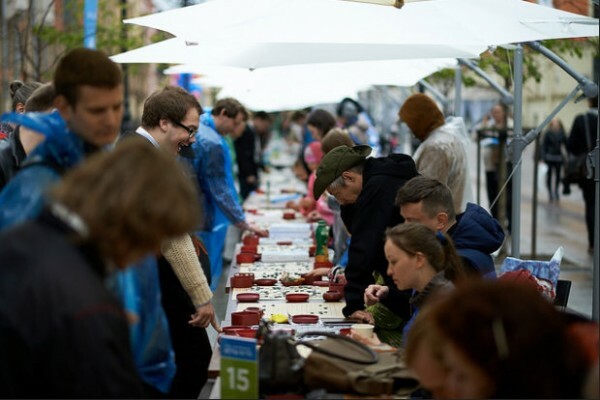 On that date, more than 200 go fans gathered in Saint Petersburg, Russia, for a massive simultaneous go game. The event took place on the street near architectural masterpiece the Kazan Cathedral. Even cold wind and drizzling rain did not deter players who turned out to challenge their country’s strongest go masters, including Alexander Dinerchtein 3P, Ilya Shikshin 1P and Natalia Kovaleva, who’s been European Female Champion. Some passersby got intrigued and played go for the very first time in their life, adding to the game’s fanbase. Every participant got a memorable souvenir and anyone who could defeat a master got an additional prize. Overall 218 people played on 191 boards, setting a national record. Click here for a video of the event (added 6/9).